Construction Industry: this course is the update required every four years for all OSHA Authorized Outreach Trainers for the Construction Industry. 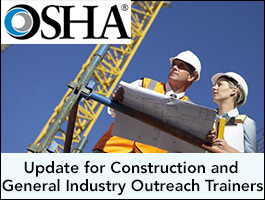 It provides timely information on OSHA Construction Industry standards, policies and regulations. General Industry: this course is the update required every four years for all OSHA Authorized Outreach Trainers for General Industry. It provides timely information on OSHA General Industry standards, policies and regulations.